Rodney ordered his officers to patrol the coast and to call at all the major outports. The governor's court became an integral part of the island's constitution. The governor's court operated as a central part of the judiciary until 1781. Reeves viewed the surrogate courts as crucially important to the administration of justice in the outports. The customary judicial system that dominated Newfoundland prior to 1815 had its origins in the remarkable administration of Governor George Brydges Rodney. In 1749 Newfoundland witnessed by far the single most important series of legal reforms undertaken prior to the grant of representative government. In what amounted to a revolution in government, Governor Rodney launched an array of initiatives that reshaped the forms of governance. Among other measures, Rodney's administration formalized two courts that became pillars of naval government: the surrogate courts in the outports, and the governor's court in St. John's. 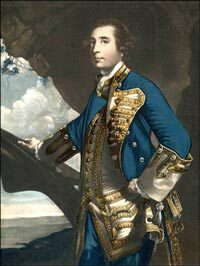 Governor of Newfoundland 1749. Portrait by Sir Joshua Reynolds ca. 1756, following Rodney's promotion to rear-admiral. Courtesy of Library and Archives Canada (Acc. No. R9266-3161) Ottawa, Ontario. To the office of governor Captain Rodney brought the zeal of an ambitious officer looking for the chance to make his mark. Since the outbreak of peace left no opportunities to distinguish himself in action, the Newfoundland station represented the only immediate chance to impress his patrons. Within a week of entering St. John's harbour in August 1749, Rodney ordered his officers to patrol the coast and to call at all the major outports. Governor Rodney decided to augment this arrangement with two additional floating surrogate courts. He informed the Admiralty that he had received a steady stream of complaints, from almost every part of the island, of illegal trading practices in the fishery and a general lack of law and order. Rodney reported: "I have been necessitated to hire two small vessels in each of which I have put a lieutenant and a sufficient number of men, with orders, one to repair to the Northern parts the other to the Southern, there to administer justice" (quoted in Bannister, 1999, 172). Treated at the time as a temporary expedient, this move marked a turning point in the history of the island's legal system. With the practice of leasing local sloops—successive governors contracted the building of specifically-designed vessels, which became known popularly as the "king's schooner"—the navy extended the government's reach into small harbours and coves that the heavy frigates had been unable to navigate. Rodney also centralized the process of information-gathering by hiring another sloop and sending a crew around the island to compile the data needed on the fishery for the British government. Captain Rodney's next move was to establish a governor's court. A direct byproduct of his drive to centralize authority, this reform became an integral part of the island's constitution. Like the surrogates' proceedings, this court had no legal foundation beyond the governor's instructions and the appellate jurisdiction granted by King William's Act. He created his own personal court at St. John's to hear and determine a variety of cases, both written petitions (many of which he could hear legally as appeals), and complaints brought in a manner similar to the sessions held by justices in outport districts. Unlike the general courts convened by commodores in the early 18th century, naval governors never shared the bench with the fishing admirals, though the St. John's justices did attend as assistants. In a treatise on Newfoundland law, Archibald Buchanan, a resident justice of the peace, offered by far the best surviving account of the governor's court. Buchanan began by noting that the governors had used their appellate jurisdiction granted by King William's Act as a basis for hearing a wide range of cases, such as actions for the recovery of debts. He then compared this prerogative to the powers wielded by governors of other British possessions: while the governors in the West Indies had a commission to preside over courts of chancery, the Newfoundland governors had no such legal powers vested in them; unlike the American colonies, the island had no courts of civil judicature. Buchanan claimed that some Newfoundland governors presided over sessions very similar to courts of chancery, while others refused to exceed their specific appellate authority; but the custom of holdings governor's courts had never been legally sanctioned. As Buchanan stated baldly: "Some of the Governors of Newfoundland have held courts (known by the name of the Governor's Courts) for determining actions of debt and causes of contested property, not properly cognizable by Justices of the Peace." "The truth is," he continued, "there is no court, legally established, at Newfoundland for determining questions at common law, which exceed the powers of Justices of the Peace" (Buchanan, 386). Nonetheless, the governor's court operated as a central part of the judiciary until 1781, when an appeal in England challenged its legality, and subsequent governors were unwilling to risk being sued for rendering unlawful judgments. Buchanan suggested that the British government formally give naval governors the authority to convene courts of judicature competent to hear actions at common law beyond the jurisdiction of justices of the peace. The most compelling reason to confer such a power on the governor was, he affirmed, the fact that "the people of Newfoundland are disposed to believe that the Governors have the power of holding courts of this sort, if they chuse to exert it" (Buchanan, 386). The customary governor's court became entrenched in the island's legal culture in large measure because it had been so firmly established by Governor Rodney. The impact of the naval officers' presence extended well beyond the period their warships were actually in port. John Reeves, who was no apologist for the navy, portrayed its officers as champions of the rule of law. Reeves argued that the office of surrogate was a well known and widely respected institution. "The time of surrogating was looked forward to as a season when all wrongs were to be redressed against all oppressors," Reeves claimed, "and this naval judicature was flown to by the poor inhabitants and planters, as the only refuge they had from the west country merchants, who were always their creditors, and were generally regarded as their oppressors" (Reeves, 154-55). Reeves overstated the case, but captured	the	essential role of the surrogate system: whether the annual surrogate courts were entirely fair or just mattered less than the fact that they were seen to represent law and order. Justices of the peace in the fishing outports relied upon the surrogate courts, where they sat alongside naval officers, as an opportunity to settle serious disputes and to complete outstanding judicial business. The annual arrival of the king's schooner was a custom which local magistrates took for granted as part of the natural course of governance. 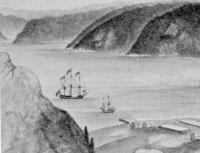 Royal Navy vessel, likely the Pegasus, in Placentia Harbour in 1786. From the logbook of H.M.S. Pegasus, 1786. Detail of a drawing by J.S.Meres.Courtesy of the National Archives of Canada (C-2525). with more information (41 kb). The surrogate system was arguably the most practicable available framework in which to administer law in early Newfoundland. Even if the British government had been willing and able to construct roads as overland links to the outports, sailing ships would still be a far more efficient means of transport. Nearly every settlement sat immediately on the coast and the island's interior was largely unknown to Europeans. The problem was that weather conditions often forced delays and made many cruises quite hazardous; Justice Reeves saw this as a serious drawback to the surrogate system, though he viewed the surrogate courts as crucially important to the administration of justice in the outports. Yet this was true for every fishing ship and applied to road travel as well. Surrogate cruises were generally restricted to the period from mid-summer to early autumn, but few ships sailed freely around the island until the ice had cleared in May and all maritime traffic slowed considerably when winter storms began hitting the coast in late November. Regardless of imperial policy, naval officers would have been unable to sail on regular surrogate cruises for the better part of six months each year. The annual courts held by the governor and the surrogates reflected the seasonal nature of the 18th-century fishery. Justice was needed year-round, which the civil magistrates provided, but was particularly imperative when the population climaxed during the summer. The surrogate and governor's courts were convened purposely to coincide with the needs of the local economy. Not only did the governor's court arbitrate civil disputes each autumn, for example, but it also fined those who contravened the set price for provisions. By the time the naval squadron was ready to set sail with the fishing fleet in the autumn, few serious cases remained to be heard. And, perhaps most important, the cost of the surrogate system was met entirely by the imperial government. No record exists of any naval officer ever receiving a special emolument or additional pay for working as a surrogate judge.